If you have installed Eclipse manually and you wish to open eclipse from the Welcome Screen you will be required to edit the default path in the registry. 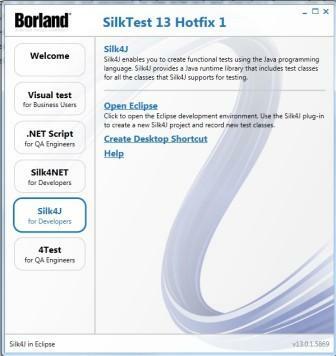 The value that is added during installation is the SilkTest root folder, for example, C:\Program Files\Silk\SilkTest (or on an x64 machine C:\Program Files (x86)\Silk\SilkTest). The Welcome Screen reads this entry and appends the sub-folder name "eclipse" and then runs Eclipse.exe from there. If you wish to use a different folder you can alter the entry in the registry, and take into account that the Welcome Screen adds sub-folder name "eclipse" to the directory read in.